On September 29th 2016, at Lam Dong Administration Center, UN-REDD+ Lam Dong PPMU co-operated with Standing Committee of Youth Union to celebrate “closing ceremony of REDD+ and climate change communication panel competition” for Youth Union members from 28 basic Youth Union Units from Agencies Bloc of Lam Dong. 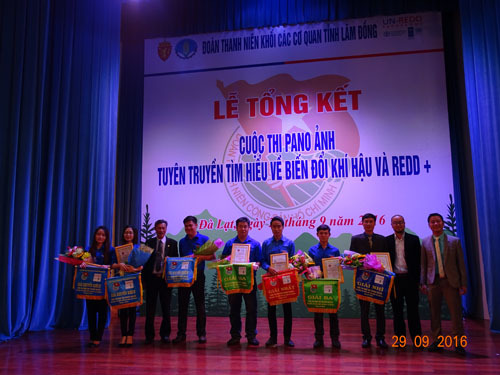 The competition is a form of communication of UN-REDD+ Vietnam phase II to help provincial youths to think, create about REDD+, climate change. From then the youths’ awareness about climate change’s effects on human, environment, plans and animals and REDD+ relevant knowledge was rose up. Planned scatter trees along the streets, cycling marched, cleaned and collected waste at their offices… so the competing works exposed the communication and education meaning, showed the readiness, volunteering of youth in topic of climate change and REDD+. A lot of works could also show the role of Youth Union. 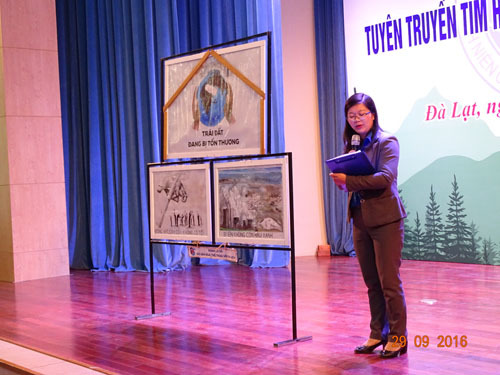 With 28 competing works, organization board graded and picked up 07 excellent works to give prizes in Closing ceremony, including: 01 collective first prize: Department of Culture, Sports and Tourism; 01 collective second prize: Department of Science and Technology; 02 collective third prizes: Department of Health, Lam Dong television; 03 consolation prizes: Department of External Relationship Affair + Industrial zones Management Board, Department of Food Safety, Department of Information Communication – Social Insurance.